The Day of the Dead or Día de Los Muertos is celebrated in many countries throughout the world but where I live, we tend to think of it as a Mexican holiday. Indeed, it is. Celebrated on November 1st, in Mexico it is treated as a national holiday and as the name implies, it is a day for families to honor those loved ones who have passed before them. One of the things I enjoy most about Día de Los Muertos is the colorful Mexican folk art that accompanies it. These portraits or shadow boxes and figurines are often brightly decorated skeletons. Some of these skeletons are referred to as Catrina, the skeleton of a high society woman in festive apparel and flowers. The traditions associated with this holiday focus on the preparation of the foods and beverages that were the favorites of those who have died. Some of these are carried to the grave sites and some are set up as altars to facilitate prayers for the dead. 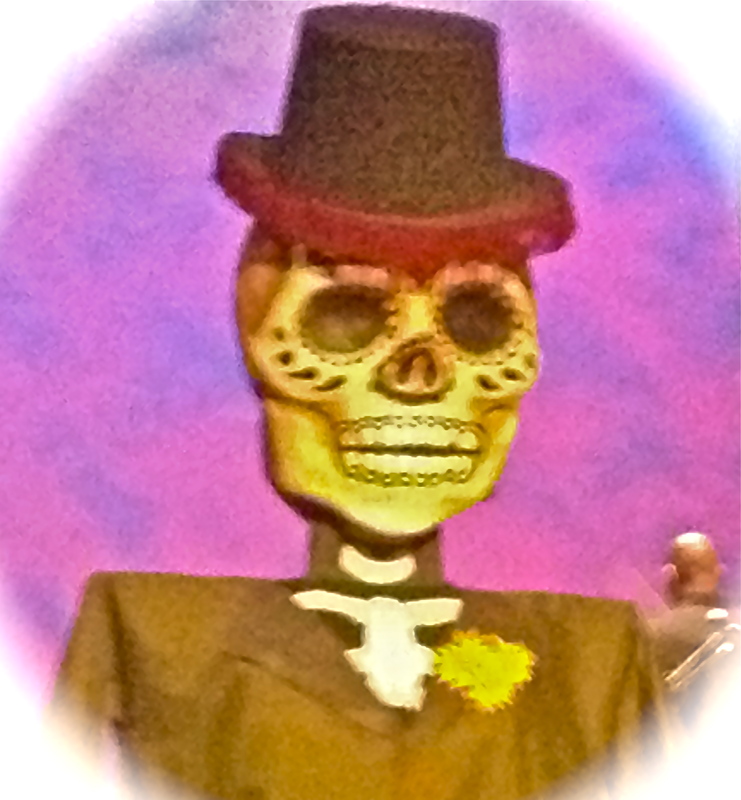 Sugar skulls decorated with icing and marigold flowers are common elements of the altars. Our CSA delivery lines up nicely against this festival. Green orbs covered with papery husks called tomatillos and a variety of peppers are in season. The easiest thing to do is to whip up a spicy Mexican salsa not only because it may have been someone’s favorite but also because it is so versatile; with chips as a dip, over eggs for a ranchero dish, as a sauce on fish or potatoes. The great thing is that the versatility hides a multitude of sins and you are free to “wing it” unless you are truly honoring the recipe of a loved one. This recipe, passed to me by the living is easy and readily adaptable to tastes. Put the tomatillos and the chiles in a cast iron skillet and toast the skin. Add garlic cloves to heat for a second. Place these items into your blender with as much cilantro as you like and salt. Spin it and enjoy! Sounds perfect and you know what amiga? You are my 10,000th comment! Tres cool. How shall we celebrate? Do you grow tomatillos in ND? No such thing here at least not that I have ever known of. Nice recipe, and a lovely post. I wasn’t aware of the tradition of preparing dishes the honored deceased liked, but I think it’s a wonderful idea, and a tradition I think I’ll start in my family, Thank you! I believe the dead think fondly of this tradition! Give it a shot. Easy to do variations on and so tasty. Oh, you make it look so easy. 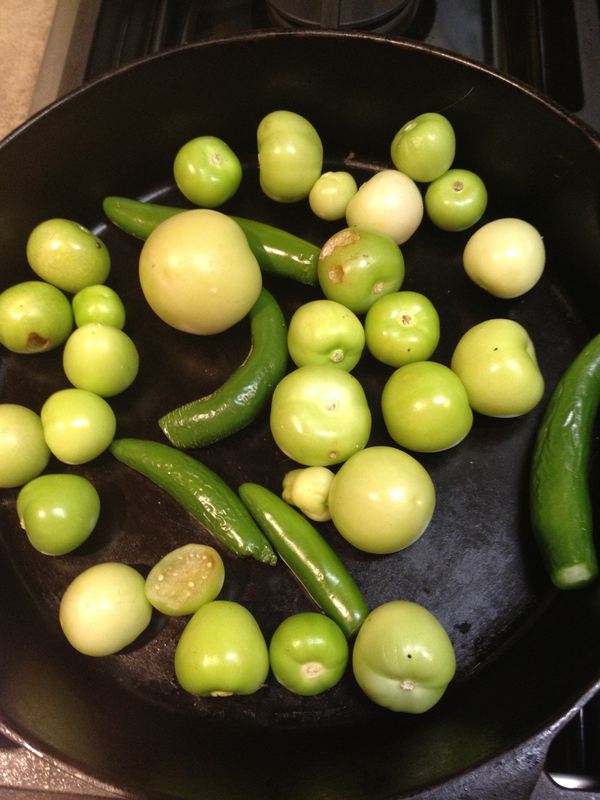 Next summer when I get tomatillos in my farm share I will pop them in the skillet first. Thanks! It really is simple and you can alter it with a spin of the mixer. We are fortunate to live somewhere that it can be honored in it’s natural state. I love tomatillo salsa. I’ve only made it once, but followed a different method. This gives me something new to try. Thanks! I really enjoy the smokiness of the roasting. It adds those delicate black flecks that deepen the flavor. This is a great time of year to visit cemeteries; there are sometimes surprising things left on gravestones – gifts to the dead, and indications that the living visited and enjoyed some time remembering their deceased friends and relatives. Nice to see tomatillos celebrated – they’re one of those under-appreciated great plants that grow in our Sonoran soil and climate with little attention. They grew in the field that we passed through on our way home from school when I was young. I just didn’t know what they were. You know what? I prefer it to tomato now! Now I’m craving tomatillo salsa. It is just the best. This one turned out rather spicy so one of my kids wouldn’t eat it but I just love it. Thank you for reminding me about this important day! As a young Catholic school girl, I always looked forward to All Saints Day, mostly because I had the day off after Halloween! Considered a Holy Day of Obligation, it was just as sacred as Sunday, and we attended Mass to celebrate deceased family and friends whose names were written in a book that was laid on the alter. I so appreciate how you value heritage, traditions and culture as important tenants of humanity. And I always love your recipes! 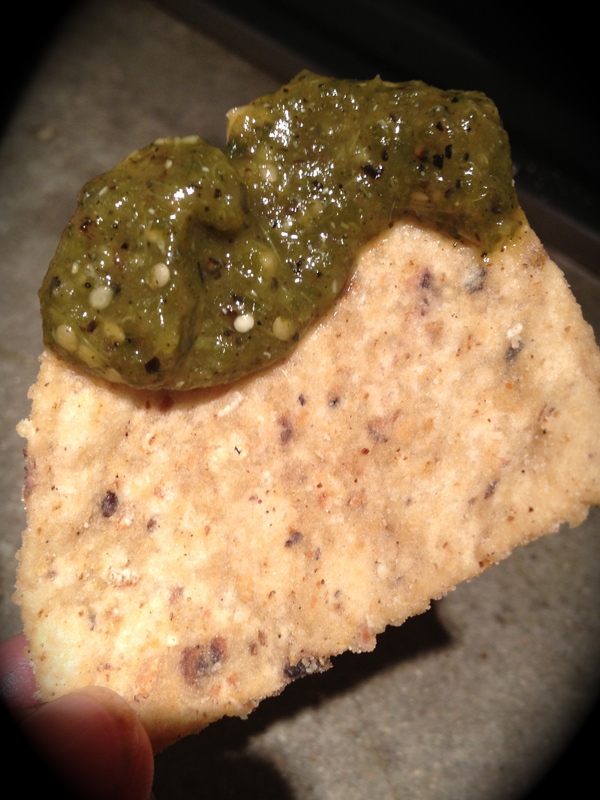 Green salsa is my favorite, and it’s about time I learn how to make it!. Mille grazie! I think we need to do some serious seeking out of the holiday in our area. 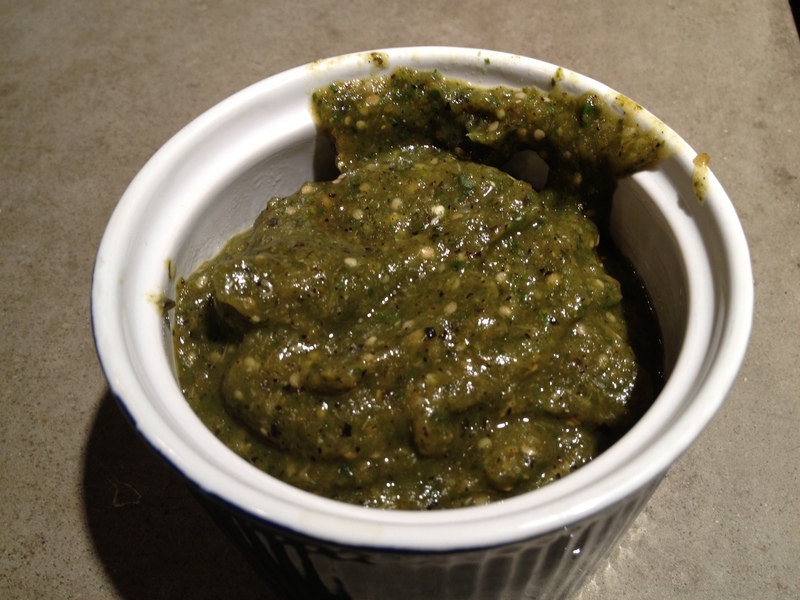 This green salsa is very good and very simple. I’m having avocado for dinner. It’s coincidental, but now I’ll feel like I’m celebrating a holiday. And if you spin an avocado in the blender with this, it is also divine. If you enjoy salsa, it would be worth a market trip. They grow in hot dry areas so not sure of your exact climate. What is local for you? Village of the Arts, the Gulf Coast’s largest Art Community, celebrates the 7th Annual Dia de los Muertos this weekend ~ the Festival of the Skeletons. There will be: Mexican Music & Food, a Village Community Shrine, a Memory Wall for Loved ones, and shrines and altars at the galleries throughout the village. The weather sounds perfect for communing with the departed souls of loved ones. Hope the have tomatillo salsa that looks as good as yours! Thanks for the recipe! I was eyeing some gorgeous tomatillos at the farmers market on Saturday, but didn’t buy them since I wasn’t sure what to do with them. I’ll have to pick up some this weekend! Hmm, I’m a little bit surprised that they grow where you live but that’s great! They were one of the “growing wild in the fields” items when I was young and walked to school. Yeah, they do well here. The lower parts of VA have pretty long growing seasons. One farmer successfully grew and harvested some pepper seeds one of her customers brought back from Jamaica! I remember that holiday well from the time I lived in Phoenix where it is widely celebrated. Interesting tradition and fascinating art to accompany it. The salsa looks great! Do you have a good place for salsa in Montana? Great post, Tammy. Day of the Dead is definitely not only a Mexican holiday, but always gets associated with that alone. We just celebrated it yesterday with flowers and candles brought to the cemetery. Oh, and the salsa looks amazing! I would love to see some photos of your celebration. It sounds beautiful. I wonder if you will be able to find them. 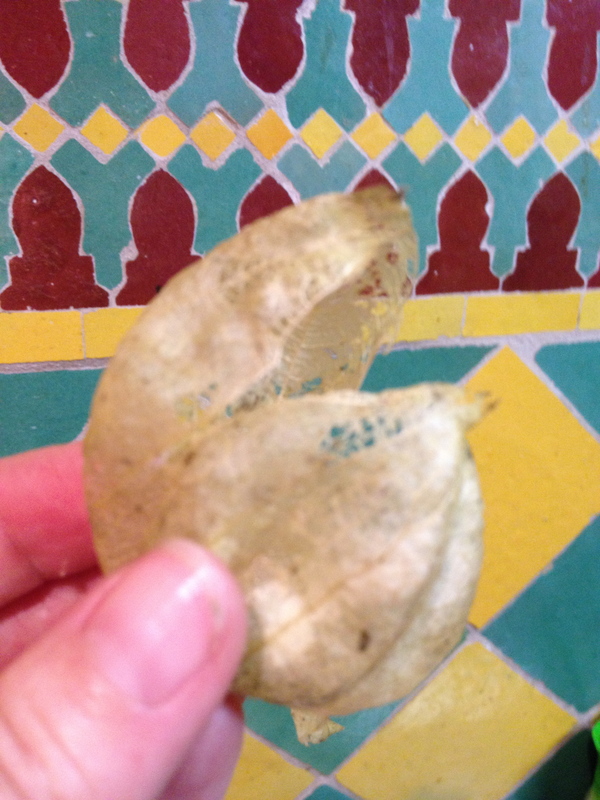 I used google translate and it says that they are called tomatillos in French also. what a beautiful day to remember death, a festival. It is beautiful, isn’t it? It’s not only festive and colorful but calls on us to remember specific people and what they loved. I need to bookmark this recipe. We don’t get tomatillos in the CSA but markets get them. Hummus and salsas are becoming our noshes of choice. This one looks awesome. Don’t you just love the ability to spin it up in the blender? I love the idea of remembering a loved one by preparing their favorite foods. I do a bit of that here, tending my aunt Eileen’s peonies and making sure her holiday dishes are made… she had a few classics that always make me think of her. I prefer to think of those who have passed as they were when they were living, rather than at their grave which I have no connection with. Cooking their dishes allows us to do that, doesn’t it? The salsa was delicious! Thanks! A bit spicy but I do like it that way. I like the idea of making a loved one’s favorite foods to in his or her honor. It’s great, isn’t it? And I bet they like it too!! I love that every time I read your blog, I learn something new – plus get great recipe ideas! Thank you! Thanks Melissa. I would love it if you’d enter your blog url on your comments – I can never get back to you. I try to provide a learning opportunity at every post. I added the link – hopefullly I did it right! Thanks so much! And it’s so easy that you can whip it up in no time. Thanks for the shout out Nancy! Thank you for the shout-out Ollin!